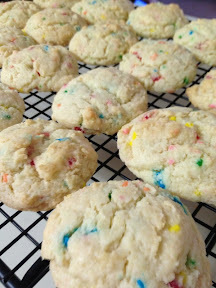 A couple of weeks ago, my friend Laura and I tried yet another "Pinterest experiment" - and tried making Cake Batter Cookies. The recipe I found on Pinterest reminded me of cookies my friend Cydni made while we were in Seminary. Yum. Those were favorites in the doom. So when I saw this recipe, I decided it was too good to pass up on a lazy Saturday afternoon. It's a pretty simple concoction. It just called for a cake mix, eggs, butter and vanilla. 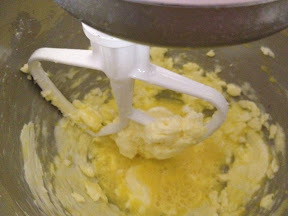 Step 1) Cream the butter, eggs and vanilla together. 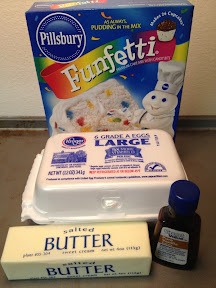 Step 2) Add the cake mix. 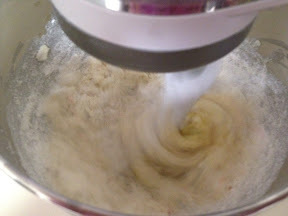 Step 3) Mix until everything is blended well. 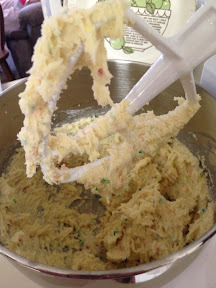 This recipe called for putting the batter in the fridge until chilled - so you could roll it out and make cut out cookies. Laura and I decided to make cookie balls using the cookie scoop. So that let us make "uniform" sugar style cookies. Step 4) We finished the cookies by icing them and topping them with sprinkles. 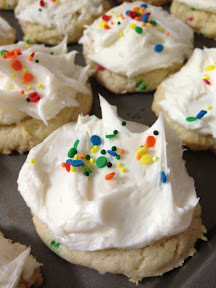 The cookies kind of turned out like the "icebox" iced sugar cookies you can purchase at the "big box store." We used a container of store-bought icing and the enclosed sprinkles. The original post had several other variations for cake mix cookies - including one with a red velvet twist - that I want to try. Chill batter for two hours. Cut with cookie cutters as desired. Bake at 350 degrees for 12 to 15 minutes, on a lightly greased or lined cookie sheet. Cool and then decorate as desired. Source: View the original post here.